US President Donald Trump will reveal details of his Section 232 tariff plan this week. The move is aimed at protecting the domestic metals industry from imports that the administration says threaten national security. Gas storage levels are running low across Europe, despite an end to last week's cold weather system that gripped the continent. And with Temperatures for the coming week expected to be milder, there are forecasts of sluggish demand in the thermal coal market, with spot prices likely to fall. Germany has cleared the final hurdle in its six-month odyssey to form a new government, following a vote by SPD party members on Sunday. Elsewhere, there could also be a change at the energy ministry in Rome, following Sunday's election results that saw a big swing away from mainstream parties. Finally, in the oil market, Mediterranean sweet crude looks set to remain under pressure in the coming week with lackluster demand for March cargoes. 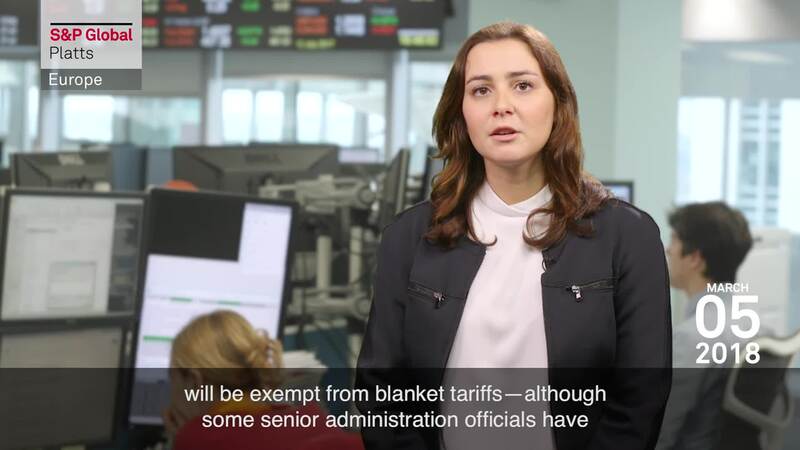 In this week's highlights: Cold weather drains Ukraine gas supplies; Germany’s new government is finally set to swing into action; and Mediterranean sweet is looking not-so-sweet for Europe’s refiners. But first: US President Donald Trump will reveal details of his Section 232 tariff plan this week. The move is aimed at protecting the domestic metals industry from imports that the administration says threaten national security. He is expected to address issues such as whether semi-finished steels and raw materials will be included, and if some countries will be exempt from blanket tariffs—although some senior administration officials have already poured cold water on that suggestion. The move has sparked fears of a trade war, with the European Commission and trade groups across the region likely to announce countermeasures this week. President Trump on Friday tweeted that the US could respond to any retaliation by imposing a tariff on European cars. Even if this kind of situation is avoided, the Section 232 plan will have direct and indirect implications for other markets, such as oil, where the cost of materials for US pipelines and wells will be affected. Turning back to Europe, and the cold weather system that has gripped the continent, nicknamed the Beast from the East, should ease this week. However, gas storage levels are running low across the region. The problem is particularly acute in Ukraine, where a new gas war is brewing between Gazprom and Ukraine’s Naftogaz, after the Russian gas giant rejected the Ukrainian company’s request to resume gas imports. Ukraine faces gas shortages due to the bitter cold. However, Gazprom, furious at having lost an arbitration case brought by Naftogaz, is threatening to unilaterally terminate its gas supply and transit deal with Naftogaz. The dispute comes after National Grid, the UK transmission system operator, issued a rare gas deficit warning for last Thursday, also due to Europe’s severe cold weather. Temperatures for the coming week are expected to be milder, giving rise to sluggish expectations for demand in the thermal coal market. Traders expect spot prices to weaken, with April-loading cargoes likely to remain well offered. That should leave Colombian coal producers looking towards Asia, but prices there have fallen coming out of the Lunar New Year celebrations, which left coal stockpiles 38% higher at the end of last week. Germany has cleared the final hurdle in its six-month odyssey to form a new government, following a vote by SPD party members on Sunday. It’s a Grand Coalition, with Angela Merkel at the helm for a fourth term. Her conservative CDU will take over the energy ministry for the first time since 1960. Major decisions regarding the phase-out of coal await the new minister. Meanwhile, there could also be a change at the energy ministry in Rome, following Sunday's election and a predicted swing to the right. Results are due later today, but, as in Germany, it may take some time before the shape of the new government becomes clear. Finally, in the oil market, Mediterranean sweet crude looks set to remain under pressure in the coming week with lackluster demand for March cargoes. Local refinery maintenance has reduced demand for grades such as Azerbaijan's Azeri Light and Kazakhstan's CPC Blend. An extremely weak Urals market has encouraged some refiners to look at switching part of their slate from sweet to sour crude. With Mediterranean sweet crude leaving a sour taste in the mouths of refiners, all eyes will be on Asian buyers and whether they can step in to take some of the pressure off the oversupplied market.